My friend Frederica has asked me to contribute haiku to her installation about uranium that will be going into the Coconino Center for the Arts in a show called Uranium Legacy. We both decided I should focus on peace. 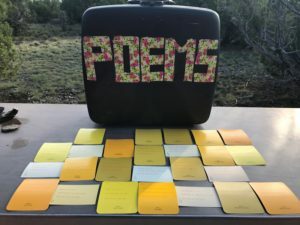 I write my best poetry on my typewriter, on the top of our land, sitting at a desk that looks out to three different mountain ranges and is snuggled in the arms of the Ortiz Mountains. 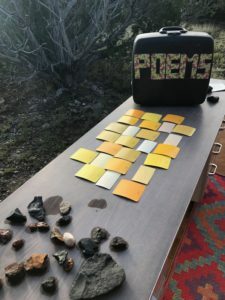 This morning, I rose with the sun for the fourth time this week, got myself up the hill to the Poetry Hut and wrote haiku on scraps of paint samples (yellow ones, of course.) I tried to imagine all the people who have been affected by uranium; the children who were given uranium toys to play with, those that lost their health mining it, the many, many victims of the atomic bombs. I tried to imagine how to help them find peace after such injustice. 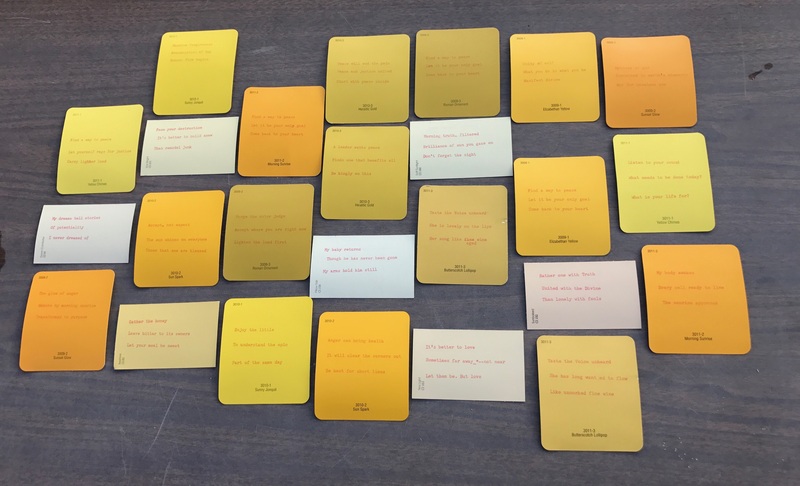 A lot of these haiku are about finding inner peace. A few of them focus on finding your voice after you have been wronged. Some are about justice. I have not been directly affected by uranium, but I understand how it is to be wronged by selfish powers. I feel anger that our earth is raped for even more violence. I don’t want people to placidly accept injustice–I want us all to find our voices to stop it, as peace warriors. This entry was posted in Uncategorized, Writings on August 6, 2017 by Elizabethhellstern.